Legend is a 2015 biographical crime thriller film written and directed by American film director Brian Helgeland. It is adapted from John Pearson's book The Profession of Violence: The Rise and Fall of the Kray Twins, which deals with their rise and fall, the relationship that bound them together, and follows their gruesome career to imprisonment for life in 1969. This is Helgeland's fifth feature film. Tom Hardy, Emily Browning, David Thewlis and Christopher Eccleston star with Chazz Palminteri, Paul Bettany, Tara Fitzgerald and Taron Egerton as well as singer Duffy featured in supporting roles. In the 1960s, Reggie Kray is a former boxer who has become an important part of the criminal underground in London. At the start of the film, his twin brother Ron is locked up in a psychiatric hospital for insanity and paranoid schizophrenia. Reggie uses threats to obtain the premature release of his brother, who is rapidly discharged from hospital. The two brothers unite their efforts to control a large part of London's criminal underworld. One of their first efforts is to muscle-in on the control of a local nightclub, using extortion and brutal violence. Reggie enters into a relationship with Frances, the sister of his driver, and they ultimately marry; however, he is imprisoned for a previous criminal conviction, which he cannot evade. While Reggie is in prison, Ron's mental instabily and violent temperament lead to severe financial setbacks at the nightclub. The club is almost forced to close after Ron scares away most of the customers. When Reggie is finally released from prison, the two brothers have an all-out fist fight on the first night after Reggie's release, but they manage to partially patch things up. The brothers are approached by Angelo Bruno of the Philadelphia crime family who, on behalf of Meyer Lansky and the American Mafia, wants to interest them in a crime syndicate deal. Bruno agrees to a fifty-fifty deal with Reggie to split London's underground gambling profits in exchange for local protection from the Kray brothers. Initially, this system is highly lucrative for the Kray brothers. Ron's barely concealed volatility results in him publicly murdering George Cornell, an associate of the Torture Gang, rivals of the Krays. Scotland Yard, as a result, opens a full investigation of the Kray brothers. Reggie beats and rapes Frances and she leaves him. Reggie then approaches her to start afresh offering her a holiday to Ibiza. Instead she is found dead after committing suicide with an overdose of prescription drugs. The brothers' criminal activities continue and Ron pays petty criminal, Jack McVitie to kill Leslie Payne, Reggie's partner who controls the legal side of the Kray's operations. He only wounds Payne, who then turns the brothers over to Detective Superintendent Leonard "Nipper" Read, the head of the investigation. Reggie finds out and brutally stabs McVitie during a party hosted by Ron. The testimony given by Payne means that Ron is arrested and charged with Cornell's murder. The final scene shows a police squad breaking down the door to Reggie's flat in order to apprehend him for McVitie's murder. Identical twins who terrorised London during the 1950s and 1960s. The wife of Reggie Kray. She met Kray at 16 and married him aged 22 in 1965. A Detective Superintendent determined to take down the Krays. The Krays' business manager. He considered himself a cultured man and he was sickened by the twins' violence. A psychopathic gay man rumoured to have had affairs with Ronnie. The head of the Philadelphia crime family and friend and business associate to Ronnie and Reggie. Charlie and his brother Eddie were leaders of a notorious south London gang (also known as the Torture Gang), which had a feud and war with the Krays' gang 'The Firm' during the 1960s. Reggie's driver at the Kray Firm, and older brother of Frances. Described as a "young and very good-looking man." Tara Fitzgerald as Mrs. Shea, Frances and Frankie's mother. A fashion photographer in the early 1960s. The gofer of Ronnie and Reggie Kray, and Reggie's chief lieutenant. On 12 October 2013, it was announced that Brian Helgeland had written a script and would be directing a film focusing on the life of Reggie Kray who, with identical brother Ronald, formed the notorious Kray twins. Helgeland said the film would concentrate on Reggie's attempts to control the psychopathic tendencies of his younger twin. Helgeland spoke of hanging out in London with well-known Krays associate Freddie Foreman, saying, "I had drinks with him in his local haunt. When we finished he got up to go and they feted him at the bar. I said to him, 'what about the bill?' and he replied, 'we don't pay.'" Helgeland attended the Cannes Film Festival with Working Title's Tim Bevan and Chris Clark to talk to potential buyers of the film and showing test footage of Hardy playing the twins. On 18 April 2014, it was announced that Helgeland would write and direct the film, with the shooting being based in the United Kingdom and with Hardy starring as the male leads. Five days later it was stated that Browning was in negotiations for a role as the film's female lead. Crews and cast were spotted filming scenes at Falmouth Road, London, St Anne's Limehouse in Limehouse and in the Windmill Walk area around London Waterloo. Filming also took place in Caradoc Street in Greenwich, London in June 2014. Principal photography started on 12 June 2014. The film was released in September 2015.
Financing for Legend was provided by StudioCanal, which also distributed the film throughout the territories of the United Kingdom, France, New Zealand and Germany in addition to handling international sales, which started at the beginning of the Cannes Film Festival. On 30 April 2014, Brian Oliver's Cross Creek Pictures acquired the North American distribution rights to Legend from StudioCanal, with a planned 2015 theatrical release through Universal Pictures in its distribution deal with the studio and Oliver also named as a producer on the film. Sales to other territories such as Asia, Africa and much of Europe are being completed. The film was originally set for a 2 October 2015, U.S. release, but it was moved to 20 November 2015. Legend premiered at the Toronto International Film Festival on 12 September 2015 at Roy Thomson Hall. On 13 June 2014, the first image of the film was published, featuring Hardy as the Kray twins. A promotional poster attracted publicity because it made a two-star review from The Guardian appear to be a four- or five-star review by placing the two stars between the heads of the Krays. Legend was released on DVD and Blu-ray in the United Kingdom on 25 January 2016 and in the United States on 1 March 2016. As of 31 January 2016[update], Legend has grossed $41,636,816 worldwide; $27,960,112 in the United Kingdom and $1,872,994 in North America. On Rotten Tomatoes, the film holds an approval rating of 61% based on 164 reviews and an average rating of 5.9/10. The website's critical consensus reads, "As a gangster biopic, Legend is deeply flawed, but as a showcase for Tom Hardy – in a dual role, no less – it just about lives up to its title." On Metacritic the film has a score of 55 out of 100 based on 31 critics, indicating "mixed or average reviews". ^ a b c Halligan, Fionnnuala (3 September 2015). "'Legend': Review". Screen Daily. Retrieved 25 May 2017. ^ "LEGEND (18)". British Board of Film Classification. 30 August 2015. Retrieved 30 August 2015. ^ "TIFF.net". Archived from the original on 1 August 2015. Retrieved 12 August 2015. ^ a b "Legend (2015)". British Film Institute. Retrieved 28 July 2016. ^ "'Legend,' 'Shaun,' Smash Benchmarks for Studiocanal". Variety. Retrieved 14 September 2015. ^ a b "Legend (2015)". Box Office Mojo. (Amazon.com). Retrieved 14 March 2016. ^ "First Photo of Tom Hardy As Both Ron And Reggie Kray". Empire. 12 June 2014. Retrieved 12 June 2014. ^ a b c "Tom Hardy image as Kray twins released". BBC. 13 June 2014. Retrieved 13 June 2014. ^ "First Look: Tom Hardy as Infamous London Gangster Twins (Photo)". The Hollywood Reporter. 12 June 2014. Retrieved 12 June 2014. ^ "The Profession of Violence". Bloomsbury. ^ "The Profession of Violence (eBook): The Rise and Fall of the Kray Twins". Waterstones. Archived from the original on 21 December 2014. ^ "The Krays: A history of violence". BBC News Online. 4 April 2000. Retrieved 10 September 2015. ^ a b c d Child, Ben (13 June 2014). "Tom Hardy plays Kray twins in Legend – first image". The Guardian. Retrieved 10 September 2015. ^ "Emily Browning in Talks to Join Tom Hardy in Crime Thriller 'Legend'". The Hollywood Reporter. 23 April 2014. Retrieved 23 April 2014. ^ "Reggie Kray's wife Frances Shea's diaries: Drunken abuse, weapons and constant isolation". The Independent. 14 May 2014. Retrieved 14 May 2014. ^ "City detective who helped crack case". Nottingham Post. 6 August 2013. Archived from the original on 29 May 2014. Retrieved 6 August 2013. ^ "Legendary court comes back to life to tell lots of thrilling crime stories". Nottingham Post. 3 September 2013. Retrieved 3 September 2013. ^ Darbyshire, Neil (30 August 2000). "Don't forget the Krays were killers". The Daily Telegraph. Retrieved 10 September 2015. ^ a b "LEGEND begins shooting, first image released". Working Title Films. 12 June 2014. Retrieved 12 June 2014. ^ "Kray made deathbed murder confession". The Telegraph. 25 March 2001. Retrieved 25 March 2001. ^ "The Kray Twins: Brothers in Arms". CrimeLibrary. 13 June 2014. Retrieved 2 May 2014. ^ "Colin Morgan Seen on 'Legend' Set by JustJared". 18 June 2014. ^ "The disputed resting place of a mobster's unhappy bride". The Guardian. 10 July 2004. Retrieved 10 July 2004. ^ "Getting Away With Murder". Google. 25 August 2006. Retrieved 25 August 2006. ^ "Aneurin Barnard To Reprise Role as David Bailey in Gangster Thriller 'Legend'". Up and Comers. 17 June 2014. Retrieved 17 June 2014. ^ "The 10 best photographic portraits". The Guardian. 5 December 2010. Retrieved 5 December 2010. ^ Weir, Andrew (27 August 2000). "Empire built on bayonets and billiard cues". The Daily Telegraph. Retrieved 10 September 2015. ^ "Toronto to join third tier English rugby league". tsn.ca. TSN. The Canadian Press. 27 April 2016. Retrieved 23 September 2016. ^ "Tom Hardy Eyes 'Legend' for 'L.A. Confidential' Writer Brian Helgeland". Yahoo Movies. 24 February 2014. Retrieved 24 February 2014. ^ "Cannes: Tom Hardy Gangster Movie 'Legend' Acquired by Cross Creek". Deadline. 18 May 2014. Retrieved 18 May 2014. ^ "StudioCanal readies Idris Elba, Ralph Fiennes films". Screen Daily. 13 May 2014. Retrieved 13 May 2014. ^ "Tom Hardy to play both Kray twins". The Guardian. 18 April 2014. ^ "Emily Browning Joining Tom Hardy and Tom Hardy in Crime Thriller 'Legend'". The Wrap. 23 April 2014. ^ "Tom Hardy begins challenging dual role as both Kray twins in new gangster biopic, Legend". Daily Mail. 11 June 2014. Retrieved 11 June 2014. ^ "Tom Hardy and Emily Browning film Krays movie Legend in London". Radio Times. 17 June 2014. Retrieved 17 June 2014. ^ "Scene set for Kray twins movie in Waterloo's Roupell Street". ITV. 6 July 2014. Retrieved 11 July 2014. ^ "Tom Hardy As Kray Twins Pic 'Legend' Firms Key Sales For Studiocanal". IndieWire. 18 May 2014. Retrieved 18 May 2014. ^ "'Magic' Sells to U.S. as 'Macbeth,' 'Legend,' 'Bastille Day' Power StudioCanal To Cannes Sales Record May 21, 2014". Variety. 21 May 2014. Retrieved 21 May 2014. ^ "Brian Helgeland commences principal photography on Legend". StudioCanal. 13 June 2014. Retrieved 13 June 2014. ^ "Cross Creek Acquires Legend's North American Rights from Studiocanal". Studiocanal. 6 May 2014. Retrieved 6 May 2014. 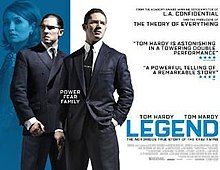 ^ "Cannes: Tom Hardy As Kray Twins Pic 'Legend' Firms Key Sales For Studiocanal". Variety. 18 May 2014. Retrieved 21 May 2014. ^ Anthony D'Alessandro. "'Legend' Tom Hardy Gangster Film Moves To November 20 – Deadline". Deadline. ^ "First Image of Tom Hardy and Tom Hardy as Twin Gangsters in Brian Helgeland's LEGEND". Collider. 13 June 2014. Retrieved 13 June 2014. ^ Young, Alex (9 September 2015). "Poster for new Tom Hardy film Legend expertly trolls negative reviewer: Gangster film proudly flaunts its two-star rating". Retrieved 10 September 2015. ^ Lee, Benjamin (9 September 2015). "How my negative review of Legend was spun into movie marketing gold". Theguardian.com. Retrieved 10 September 2015. ^ "Legend DVD and Blu-ray". releases.com. Retrieved 2016-03-04. ^ "Legend (2015)". Rotten Tomatoes. Fandango Media. Retrieved 11 April 2018. ^ "Legend Reviews". Metacritic. CBS Interactive. Retrieved 7 December 2015. ^ a b c d e f "Legend – IMDB". Retrieved 7 January 2016. ^ a b Nugent, John. "Jameson Empire Awards 2016: Star Wars and Mad Max lead the nominations". Empire. Retrieved 2016-03-15. ^ a b Metro.co.uk, Rebecca Lewis for. "Mad Max: Fury Road leads the pack at the 2016 Jameson Empire Awards". Metro. Retrieved 2016-03-15. ^ a b "Evening Standard". Retrieved 17 January 2016. ^ "The 42nd Annual Saturn Awards nominations are announced for 2016!". Saturn Awards. 24 February 2016. Retrieved 4 March 2016.